Greetings, Hunters! We've received word that members of A.R.K. are planning to infiltrate one of our most precious facilities, and it's up to your team to locate and eliminate the threat. Let's introduce you to the other Raxxon Hunters that you'll be serving alongside. What could be more helpful than a second set of eyes? Well, maybe three extra sets! 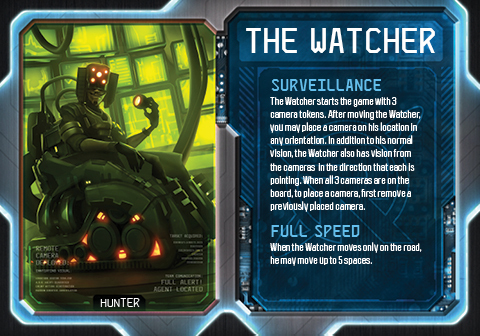 The Watcher begins the game with 3 camera tokens that serve as extra points of vision, meaning if the Agent crosses their path they'll need to place the last seen token as though the Watcher were there! Hunters can establish a dragnet that forces the Agent's movements with these camera tokens. In addition to the use of camera tokens, the Watcher can also reach full speed on on road spaces, moving 5 spaces instead of 4. 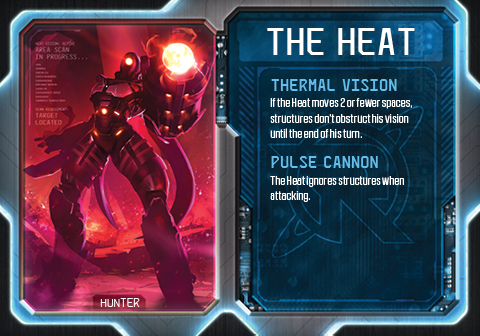 The Heat is potentially the most relentless Hunter in Raxxon's employ. The Thermal Vision ability allows the Heat to see through obstacles, so long as the Heat does not move more than 2 spaces on a turn. The Agent will quickly find that there's no place to hide once the Heat finds their trail. If the Agent is located, the Heat can then use the devastating Pulse Cannon to attack through obstacles. The Judge holds justice in the balance, giving the Agent an equal chance at evading or being exposed. 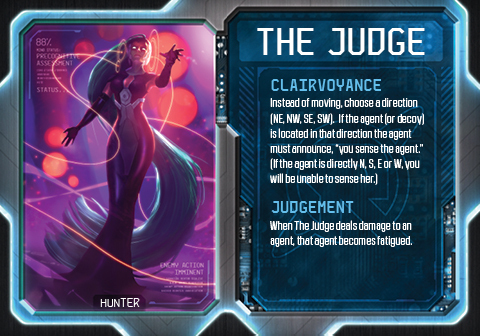 The Clairvoyance ability can hone in on the general location of the Agent, provided that they are not directly North, South, East or West of the Judge. The Judgement ability will fatigue any Agent damaged by the Judge, limiting their access to abilities. The Tracker is a seasoned Hunter that's proven himself many times over. His loyal pet, Rover, is not only trained to identify the Agents but also to attack on sight. Rover moves after the Tracker does, following the same rules a Hunter would. 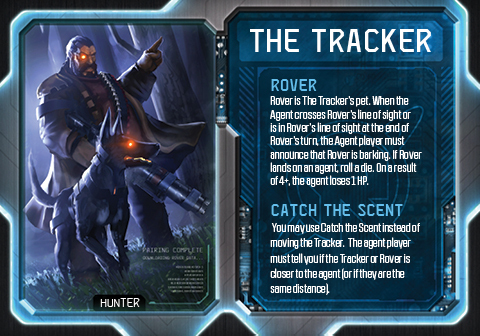 The Tracker may instead use the Catch the Scent ability to determine if the Agent is closer to the Tracker or Rover. You'll need to work together and coordinate your efforts to locate and eliminate the Agent. Raxxon is counting on you to safeguard its secrets. Stay tuned for more information soon on the Agents of A.R.K., and remember Sepcter Ops: Broken Covenant will be available soon from retailers and our own web store!